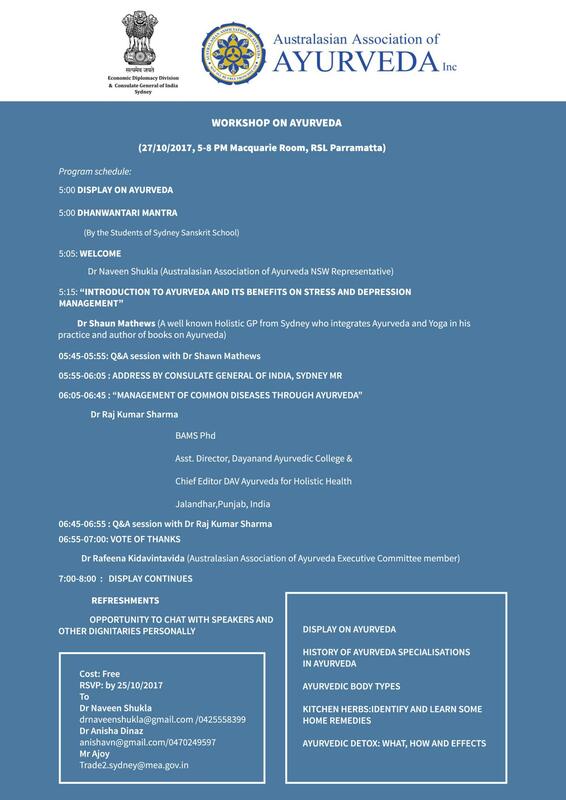 The Australasian Association of Ayurveda, NSW and Consulate General of Sydney together are organising a free event on Ayurveda for the public. The event comprises talks on Ayurveda by international speakers, displays on various topics on Ayurveda & includes personal care and light refreshments. Grab this rare opportunity to enlighten yourself with Ayurveda and to shoot your questions! Book now! Only limited seats available. RSVP to Dr Rafeena on 0469 928 491 or info@drrafeena.com by 25/10/2017 or to any contact listed on the flyer.